LA’s Best Burger at 26 Beach? Just like looking in a window at Lafayette. 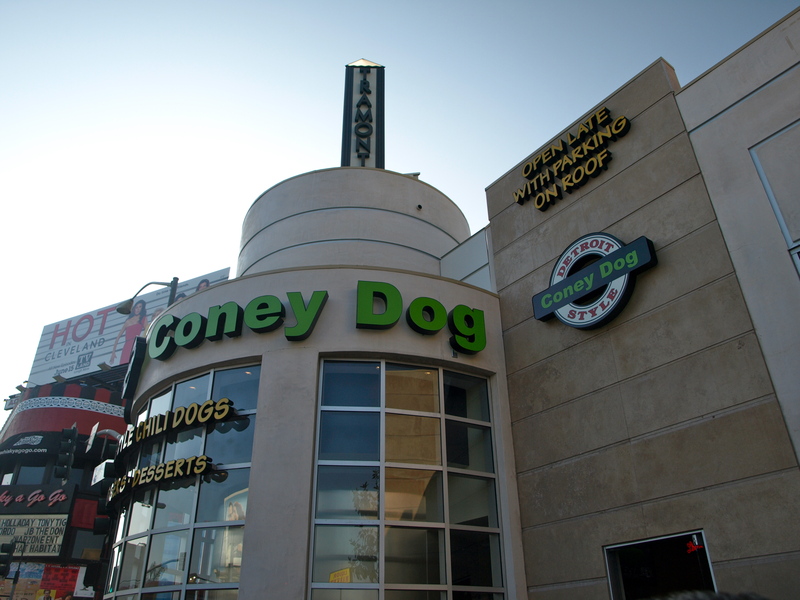 A combination of famous Michiganders like Mike Binder, Tim Allen and Kris Draper (adopted Detroiter) moved forward with bringing coney to LA, specifically the Sunset Strip. 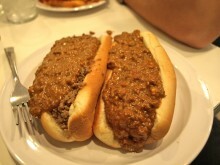 Finally, after months of anticipation (and likely years for the owners), Coney Dog soft-opened on Sunday. 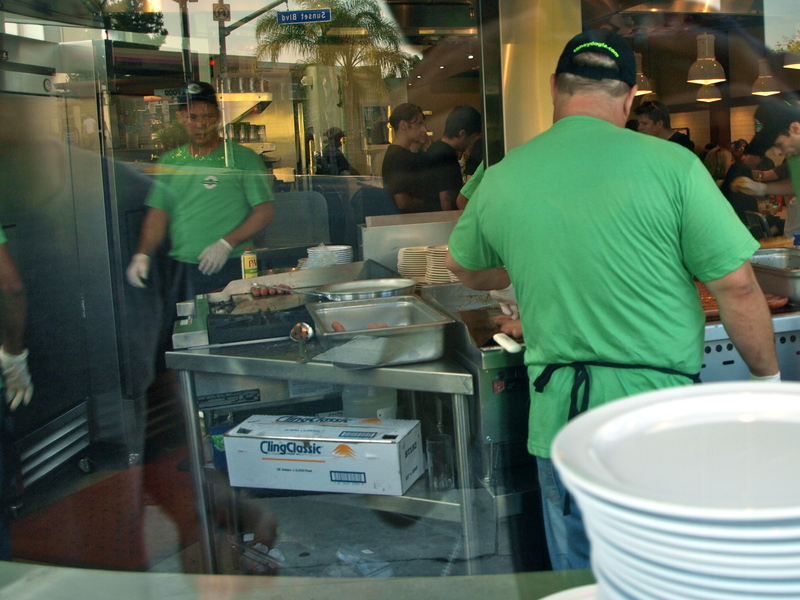 The opening was limited to Facebook fans and those fans were even rewarded with a coupon for a free coney dog, loose burger or fries. 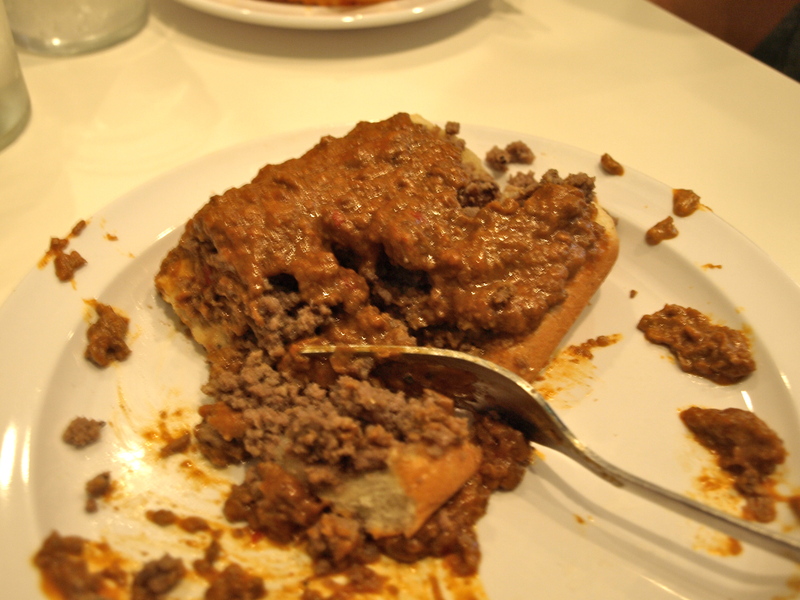 If you haven’t yet read one of my Detroit-area coney reviews and don’t hail from Detroit, you’re probably now wondering many things. First, what is a coney dog? Second, what is a loose burger? And third, who is Kris Draper? 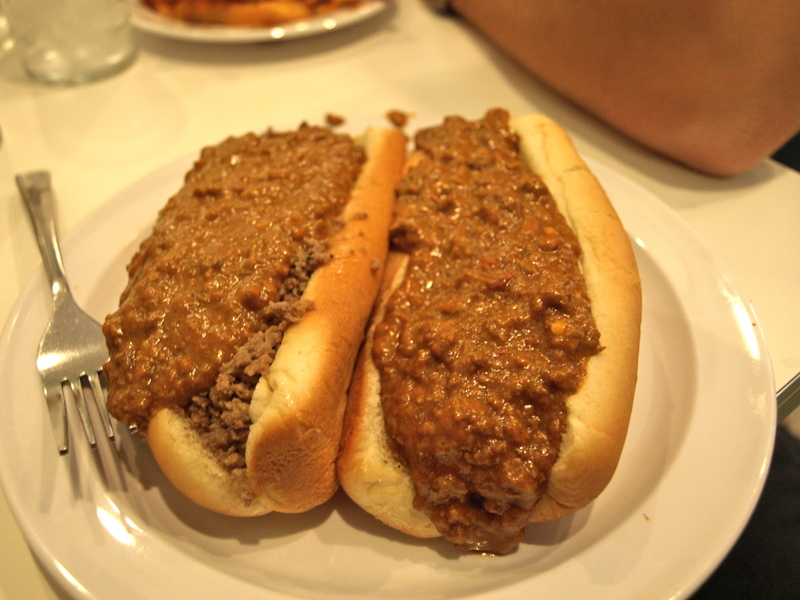 A coney dog is a natural casing hot dog composed of a beef and pork mix, topped with a Greek-style wet chili, mustard and onions. A loose burger is essentially the same, but in place of the hot dog is loose ground beef (not formed into any sort of patty). Oh and they each are served in a steamed bun. Finally, Kris Draper is a center for the Red Wings, the greatest hockey team in the world. No frills, but the Tigers and Lions will be on that TV. I arrived to find a long throng of people waiting in line to get a taste of Coney Dog. Judging by the Tigers shirts, University of Michigan caps and Michigan State stockings, it was obvious that this line was populated by expats like myself. It took about 45 minutes to get inside (an issue that I’m certain will pass after the grand opening), but once inside, I found a pretty authentic coney experience. 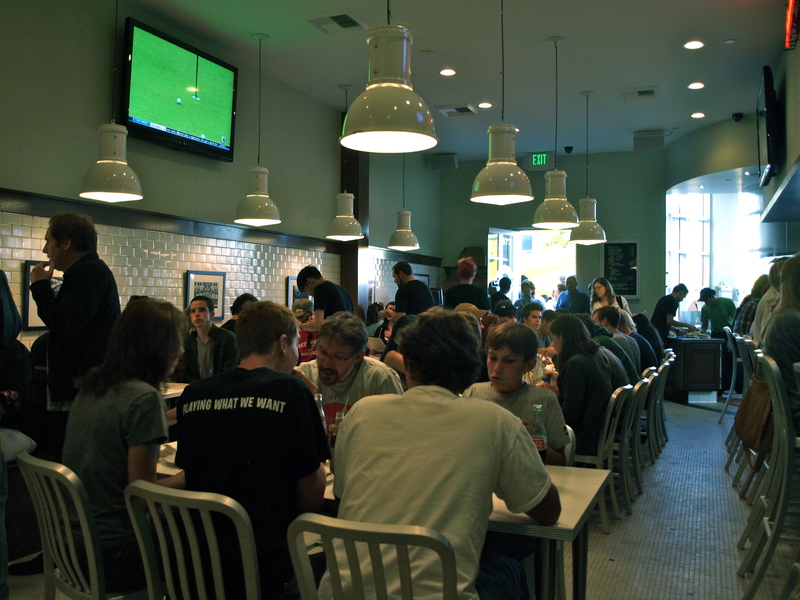 The interior was no-frills, the staff were incredibly friendly and I even saw people I knew (which always happened at Leo’s). A huge difference was the menu. Where coneys in the Detroit area offer a huge variety of Greek and American food, Coney Dog stuck to the basics and I think that was a wise decision. I ordered a coney dog, a loose burger and some chili cheese fries, and topped it off with another Detroit staple – Faygo Red Pop. That’s right, pop. 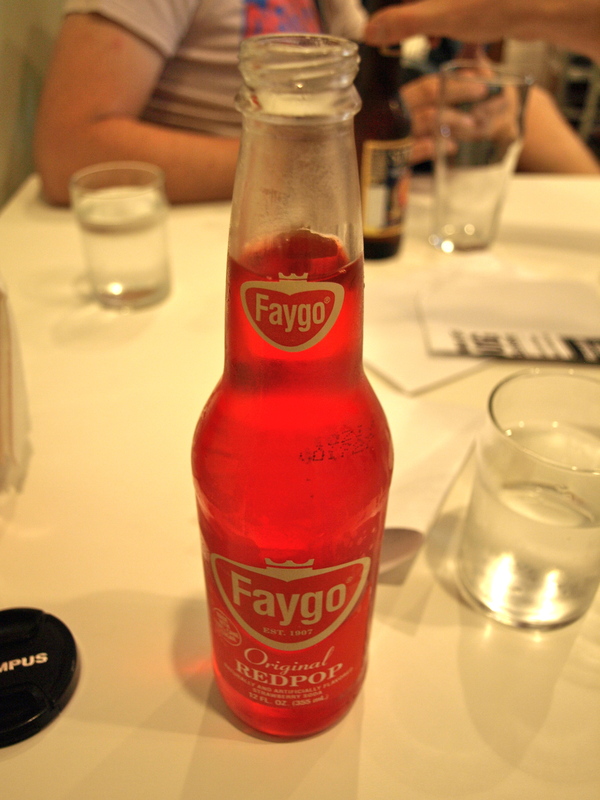 In Michigan, soda is something you bake with. In a very un-Detroit fashion, I ordered my dog and burger with onions or mustard. Sorry, I just don’t like that crap. Weird how it’s called pop and not soda. Oh, by weird I mean awesome. The food took a few minutes longer than a normal coney, but definitely not long enough to complain about. After all, this was the soft opening and when you order food at coneys in Detroit, the food is usually finished before you got your last word out. 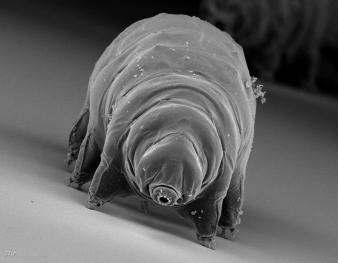 And boy were these things beautiful. Coney Dog did not hold anything back with the chili, which was fully loaded and completely hid the actual hot dog from view. I could have used a knife to go with my fork, but instead I went right at them and chowed down with no regard for the chili and beef that would be strewn about my hands, table, plate and shirt. I know it looks like vomit. But it tastes like amazing. They nailed it. The chili was perfectly spiced, delightfully wet and nostalgic as hell (because hey, I hadn’t been to Detroit in 3 weeks). The hot dogs that had been imported from Michigan were cooked to perfection on the griddle and the steamed buns did not fall apart even as the chili and ground beef overflowed from within. And of course, the beef in the loose burger was everything it was supposed to be. Does crinkle-cut equal sliders in the future? I was a little surprised to find the fries crinkle-cut rather than the straight up thin fries. To me, this sort of fry is more closely associated with real Detroit sliders and gave me the hope that perhaps true sliders would someday make it to the menu. The fries had been cooked well-done, which I always prefer. 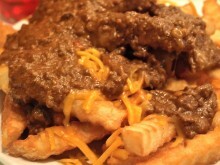 Plus, they held up strong against the wet coney chili and refused to get soggy. If you order Stroh’s, your meal might look as good as this. Coney Dog also offers a selection of beers and touts Stroh’s, a native Detroit beer. I love my beer, and I love that they were able to get beer from Detroit, but in truth I’m not the biggest fan of Stroh’s so I’m hoping they are able to get some other Midwestern and Michigan beers onto the tap at some point. 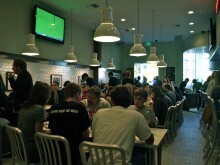 Nonetheless, the rest of their beer selection was great and when I get a chance to sit down, relax and have a longer meal at Coney Dog, I will be sure to have some drinks. So, after months of anticipation, I’ve got to say that Mike Binder and his motley crew of Detroiters have pulled off something truly remarkable. Not only has Coney Dog brought the true taste of Detroit out to Los Angeles, he has brought a truly Detroit experience with it. Even more remarkable is that he kept the price within reason. At 4 bucks for a dog and 4.50 for a loose burger, the value is most definitely there. These dogs may only cost 2 bucks in Detroit, but that differential is a whole lot cheaper than a flight to DTW. I’ll definitely be back. Probably tomorrow. And thanks to Joel for that shot of Stroh’s. I’m so excited for you expats and especially happy that we may not have to go to Leo’s everytime you’re in town! Thanks for the shoutout Zack! Coney Dog truly does live up to form. You must try it people! Can you get a Facebook / Twitter button your site so it’s easier to “like” and “tweet”? Oh, great blog post, too! Thanks for reading! I’ll work with my developer about getting that “like” button in there. I do have a twitter and facebook link at the top of each post so you can at least share the posts, but they are styled like my site, so may not stick out too much.